Chase is 23 years old and lives in Roswell, Georgia with his parents and faithful Canine Assistant, Clipper. Chase enjoys getting together with friends, flirting with girls, listening to music, and hanging out with Clipper. He has a lot of fun playing buddy baseball, as well as a variety of wheelchair sports with the Titans. Despite the fact that Chase cannot see, speak or walk, he gets great pleasure just being around other kids. He has a great sense of humor and a laugh that draws others to him. His favorite part of the Titans is the opportunity to get together with all the kids, but if they ever add cheerleaders, that would become his favorite part! Jimmy (Jimbo) Crivolio is 21 years old. At the age of 7 months, Jimmy was diagnosed with Spastic Quadriplegia (Cerebral Palsy). Jimmy has little to no use of his legs or arms and is dependent on others for his care. He lives with his Mom and Dad in Roswell, Georgia. Jimmy’s physical disabilities do not limit his activities. He is a senior at Roswell High School and will receive his high school academic diploma in May, 2015. During the week, going to school and homework keeps Jimmy very busy. He plans to continue his education in the future. Jimmy loves going to the movies with his friends or having them over to his house. He also enjoys going to the beach, where he can “ride” the waves, listen to his music, and take in some rays. The Titan’s schedule, both social and athletic, keeps him busy on the weekends. Jimmy’s love for wheelchair sports is only exceeded by his love for being with his friends. He receives assistance with movement of his wheelchair but this does not impede the fun that he has by being able to participate in these sports. Jimmy plans to continue enjoying his life to the fullest possible extent and the Titans are a major contributor to improving Jimmy’s quality of life. Kylie is 26 years old and lives with her parents in Roswell, Georgia. Kylie has a psychology degree from Reinhardt University, graduated from All About; Developmental Disabilities Partners in Policymaking Program in 2011, and completed the Georgia LEND program through the Center for Leadership in Disability at Georgia State University in 2012. Her passion in life is advocating for people with disabilities. She recently worked for a non-profit called Great Prospects where she taught self-advocacy and life skills classes to young adults with developmental disabilities. She has also served on the advisory board for the Georgia Council on Developmental Disabilities. Kylie currently works at All About Developmental Disabilities (AADD) where she helps create activity groups for young adults with developmental disabilities in the suburbs of metro Atlanta, and oversees a leadership program for young adults called the ambassador program. Kylie truly enjoys her work and loves playing wheelchair sports. She is so grateful for The Titan program for giving her the opportunity to play sports and be with her friends. Jon is 27 years old and lives in Dahlonega, Georgia with his parents, and multitude of neon aquarium fish! He is a very accomplished individual. Jon holds a Bachelor of Science degree from Johnson & Wales, the #1 culinary school in the country. He is an accomplished athlete - a baseball pitcher, wrestler, certified scuba diver, hunter, fisherman, and he still holds a track record at Perimeter School. He has had to leverage these experiences and strengths ever since a serious car accident in December 2013 that resulted in a brain injury and physical challenges he is still learning to overcome. Above all, Jon is a fighter – on his first day as a Titan, he courageously transferred from his street wheelchair into a one armed sports wheelchair, and then took off down the court displaying that same competitive spirit he displayed in other sports. On or off the court, Jon’s actions reflect an inner strength and peace that defies all odds. Jon enjoys getting together with longtime friends where he is typically the life of the party! He hopes to follow his dream of one day becoming an attorney! Jon lives by his family's favorite scripture, Phil 4:13, I can do ALL things through HIM who strengthens me. Derek is 32 years old and lives with his mother in Alpharetta, GA. He is a graduate of the University of West Georgia and teaches English to special needs students and considers it a labor of love. He has Cerebral Palsy, which simply means that he walks with a crutch. He doesn’t allow his “disability” to define him; he considers it part of his testimony. His disability’s inherent challenges have helped Derek develop faith, perseverance and character. Thus, giving credence to Romans 8:28 when it says, “And we know that in all things God works for the good of those who love him, who have been called according to his purpose.” Derek enjoys hanging out with his Titan family, exercising, teaching Bible study, learning new things and traveling. He appreciates the Titan’s infectious optimism, encouragement as well as their desire to live out their faith in their community. Brandi is 16 years old and lives in Alpharetta, Georgia. She is the youngest of 4 girls and has a twin sister named Brianna. Brandi loves church, listening to music, volunteering at her school's CBI program and the Interact Club. She also enjoys writing poetry and spending time with her family and Titan friends. Brandi has Cerebral Palsy. However, she doesn't let her condition define her. She is destined for greatness. Natalie has always loved sports! She has played wheelchair sports since elementary school and now, at 27, is so thankful to be a part of the Titans. Since beating cancer and too many surgeries to count, Natalie has no use of her right side. It’s amazing to watch how she can dribble, throw and catch with only 1 hand, all while working the wheelchair. Natalie spends her time working at Trader Joe's, watching sports on TV and hanging with her Titan friends. She looks forward to every scrimmage and all the fun Titan social events. Natalie is quick to laugh, always wanting to help and has such a will to live, she is a wonderful inspiration to her family. Matt is 26 years old and lives with his parents in Johns Creek, Georgia. Matt's physical disabilities are due to a rare mitochondrial disease. However, his condition does not limit his zest for life! Matt enjoys working at Starbucks and volunteering at Canine Assistance training service dogs. His favorite activities include downhill skiing, Titan wheelchair sports, horseback riding, and church on Sunday. Matt LOVES sports and is known for being an avid Duke Basketball and Georgia Football fan. His favorite thing about the Titans is hanging out with his friends – laughing and joking around! Trey Quinn is 15 years old and is a freshman at Cambridge High School. He lives in Milton with his parents, his Canine Assistant, Whit, and two cats. Trey has one sister who attends UGA, studying to become a veterinarian. At school Trey is active in Future Business Leaders of America and the computer science department. He loves music and anything techie. If you have a problem with your cell phone or tablet, just ask him. When asked what chores he does at home, he answers, "Tech support!" Trey has a great sense of humor and a competitive spirit. He loves hanging out with all his Titan friends and their families, and he loves zooming down the court! Susie is 33 years old, has cerebral palsy and is nonverbal. One of her favorite pasttimes is to shop for new clothes, but what she always wears best is her infectious smile. People naturally gravitate to her because of that smile! She easily makes friends wherever she goes, and they all truly mean the world to her! Susie loves being a part of the Titans. She mostly enjoys the social events, where you can often hear her loud laugh. Her interests include: going to movies and concerts, listening to music, reading, Bible study and church activities. Susie has participated in advocacy in her community and is personally responsible for the addition of handicap accessible doors and elevator access in buildings that she frequents. Having a strong faith helps Susie to be courageous and inspires others to make a difference in the world. To her, there are no such things as barriers! Garrett Couch is 28 years old. He was born with Spina Bifida and, as a result, is a paraplegic in a wheelchair. He graduated from Kennesaw State University with a degree in Anthropology. Garrett enjoys hanging with friends, hosting bible studies, and watching movies. Garrett has been with the Titans group since its inception, and has a large history with many of the Titan team members. He enjoys teaching others on the team that God has a purpose for everyone, and that no worldly hindrances will stop His path for them. Jason is 33 years old and lives in Canton, Georgia. He was born with Spina Bifida, which caused him to be paralyzed from his hips down. 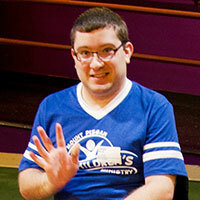 Growing up, Jason enjoyed playing wheelchair basketball and tennis. He received a bachelors degree in Early Childhood Education from Kennesaw State University and applied this by working at High Meadows Summer Day Camp for 9 years and as a substitute teacher for High Meadows School. He volunteers daily at Mimosa Elementary School and has a fourth grade position in the after school program called STAR HOUSE at Mimosa Elementary School. Jason also volunteers in the local community by being a small group leader for the Children’s Ministry at Mount Pisgah UMC in Johns Creek, Georgia and for Game Nights at a non-profit called All About Developmental Disabilities. His favorite activities include playing wheelchair sports with the Titans, hanging out with the Titan members, reading, following and studying weather, and of course serving the community.